The 161 people onboard a Mumbai-bound Jet Airways aircraft had a miraculous escape when it skidded off the runway and spun around before coming to a jerky halt as its nose sat on the soft land while rolling for take off early Tuesday at the Goa airport, leaving 15 passengers wounded. There were 154 passengers and seven crew members onboard when the Boeing 737 aircraft turned a full 360 degree on the runaway, veered towards the soft land, damaging the landing gear in the convulsive process around 5am. The nose cone sat on the grass about 250-300 metres away from the runway, indicating the seriousness of the accident that could have been disastrous. 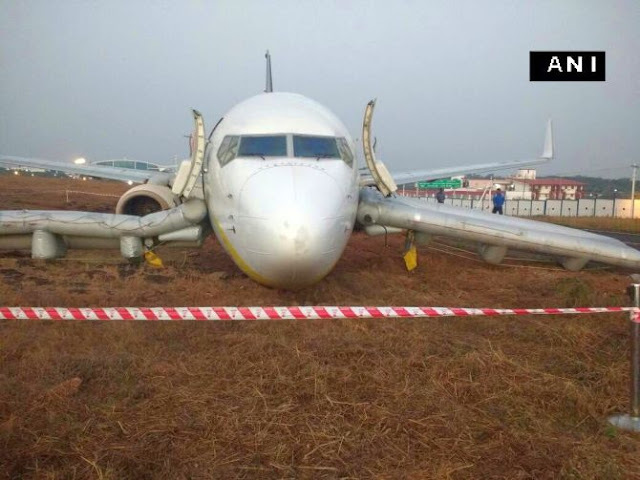 "At about 0504 hours on 27 December (Goa-Mumbai) flight veered right from the runway 26 while rolling for take off. ATC duty personnel on runway reported aircraft leaving runway and subsequently received distress call from aircraft. "The aircraft came to a halt about 250-300 metres away from runway. The emergency crew of the Indian Navy were immediately dispatched in rescue vehicles to crash site. All persons onboard were evacuated and medical aid on the the site was provided by MI Room, Hansa. Total of 15 persons were injured and medical aid was provided by local hospitals," the Navy said in a statement. The Goa airport is located at Navy's Hansa facility. There was panic inside the aircraft as the plane jerked when it spun. 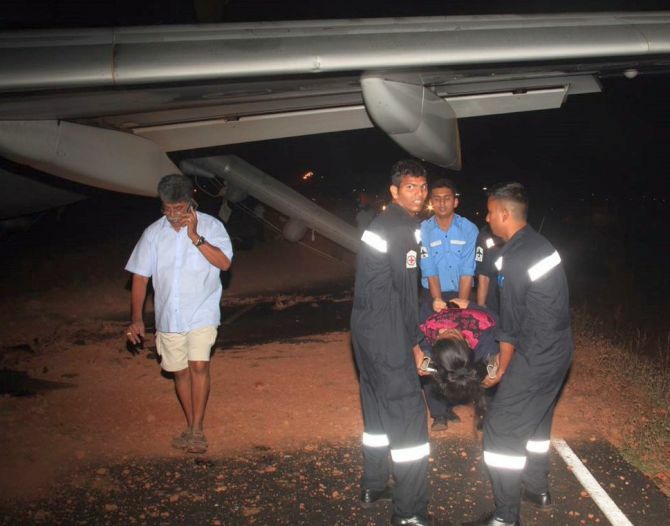 The "minor" injuries to the 15 passengers came when they were being evacuated from the stricken aircraft. The flying licence of the two pilots was suspended and a probe launched into the accident. It will be conducted by Aircraft Accident Investigation Bureau of the civil aviation ministry. Civil Aviation Minister Ashok Gajapathi Raju said a thorough time-bound investigation and corrective action shall be ensured. Action will be taken in case of violation of procedures, he added. Seven of the injured have been discharged from the hospital after being provided medical aid and the airline's flight operations to and from Goa have resumed, Jet Airways said. Meanwhile, AAIB has rushed a three-member team to the "accident" spot to start its investigation, sources in New Delhi said. The incident took place at around 5am when flight 9W 2374, which had arrived from Dubai and bound for Mumbai, was about to take off. When the evacuation was on, the aircraft tilted forward, an eyewitness said, triggering panic among passengers. “When people were getting down the plane, the escape chute suddenly tilted forward triggering panic and chaos,” a passenger told reporters at Chicalim Cottage Hospital in Vasco. The Goa airport is located in a navy facility, INS Hansa in Vasco town, nearly 25 km from Panaji. The runway was made available for flight operations at 9 am, hours before the initial deadline of 12.30 pm. Soon after the incident, Navy officials had cordoned off the aircraft that had tilted towards its front end, while the passengers were being alighted. “After the passengers were evacuated, the operation to rescue the aircraft started. The damage to the runway was also assessed by a team of Indian Navy and Airport Authority of India officials,” the spokesperson said. “There was lot of muck on the runway as the flight was grounded on the sides of the runway,” he said. "Prima facie the runway accident appears to be a pilot's fault. The DGCA has withdrawn the flying privileges of the two pilots, including the Commander, pending the initial outcome of the probe," a highly-placed DGCA official said. Sources in the AAIB also said that in all "probability," the accident took place because of the pilots fault, adding, "We will get to know the actual cause of the accident only after the initial report is submitted in this regard." Sources said the preliminary findings on the accident are likely to be submitted in a week's time. The Navy's statement said flying operations were suspended till 0900 hours and aircraft in air were diverted. The stricken aircraft will be shifted only after the clearance by the AAIB, it said. A Mumbai-bound Jet Airways plane carrying 161 people skidded off the runway on Tuesday at Goa’s Dabolim airport in western India. The Boeing 737 aircraft with 154 passengers and 7 crew members on board veered off on the runway minutes before it was scheduled to takeoff early morning from Goa, a popular holiday destination to travel to India’s financial capital Mumbai, the airline said in a tweet on Tuesday. India’s Directorate General of Civil Aviation and Aircraft Accident Investigation Bureau are among the authorities investigating the incident. The airline said it will cooperate with investigating agencies and deploy a bigger Boeing 777 aircraft to transfer all passengers to Mumbai. The plane left the runway inaccessible for hours. India’s naval force, which helped in the evacuation process and clearing up the runway said in a tweet that the airport was now operational again. In a separate incident at New Delhi, a SpiceJet aircraft came face-to-face with another plane on the taxiway. “Acting promptly, the Spicejet crew immediately stopped the aircraft and intimated the ATC [air traffic control],” the airline said in a series of tweets. Ashok Gajapathi Raju, India’s minister for civil aviation said in a tweet that a time-bound investigation will take place in the incident involving the Jet Airways plane. “Action will also be taken in case there is violation of procedures,” he said. 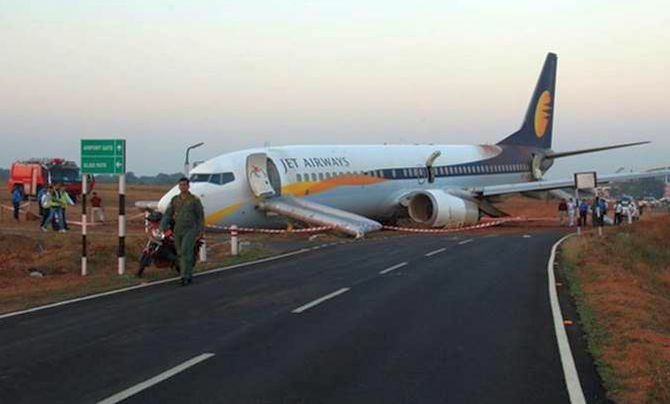 A Jet Airways Boeing 737 aircraft with 161 people on board veered off an airport runway in Goa shortly before take off just before daybreak on Tuesday, crossing a field before spinning into a ditch on the side of a service road. A dozen people suffered injuries as the 154 passengers and seven crew on the Mumbai bound flight were evacuated, Jet said in a statement. "The flight 9W 2374 from Goa-Mumbai skidded off the runway at Dabolim airport this morning due to a technical glitch while aligning for takeoff," the statement said. December is the busiest month for Dabolim airport, outside state capital Panjim, as holidaymakers flock to Goa's palm fringed beaches and exotic tourist markets during the winter season. Television images showed injured lying on stretchers in darkness on the service road, with fire engines parked near the stricken plane, which appeared to have lost its front undercarriage, and damaged a wing as it rested on its belly and engine casings. Some passengers said they saw smoke in the cabin as the aircraft began taxiing on the runway. One of the injured described how the accident unfolded. "I fractured my leg," said Dinesh Kumar, a passenger on Times Now TV channel. "The moment the plane started running on the runway, it slipped into the nearby field and there was smoke inside the flight." A Jet Airways spokeswoman said the carrier was looking into how the incident occurred. "It needs time for proper investigation to go on and we are cooperating with the DGCA (Directorate General of Civil Aviation)," she said. The airline is India's second largest passenger carrier. In a separate incident in New Delhi airport, a Spicejet airplane was preparing to take off at the same time as a flight run by Indigo had landed and was headed to the runway's taxiway, but the pilots avoided a collision and no-one was injured, the two companies said in separate statements. Indigo and Spicejet said they were working with authorities investigating the incident. Air travel is surging in India, one of the world's fastest growing economies. Passenger numbers on domestic flights jumped 21 percent in 2015 to more than 80 million. The government foresees that number growing to 300 million by 2022. 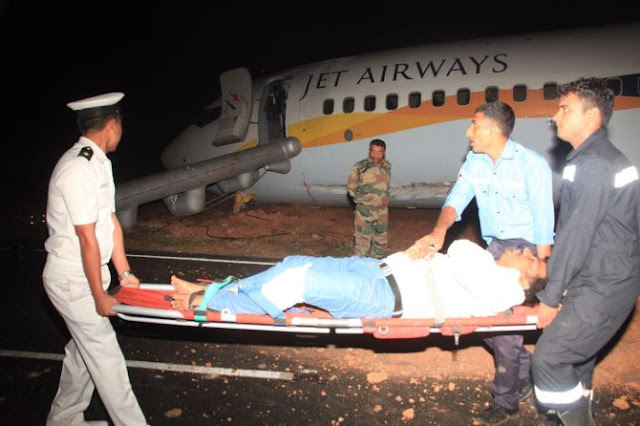 0 Response to "Jet Airways flight spins out of control in Goa; 15 hurt, 2 pilots suspended"